Given the fact that there are perhaps 400 billion stars in our Galaxy alone, and perhaps 400 billion galaxies in the Universe, it stands to reason that somewhere out there, in the 14-billion-year-old cosmos, there is or once was a civilization at least as advanced as our own. The sheer enormity of the numbers almost demands that we accept the truth of this hypothesis. Why, then, have we encountered no evidence, no messages, no artifacts of these extraterrestrials? In this second, significantly revised and expanded edition of his widely popular book, Webb discusses in detail the (for now!) 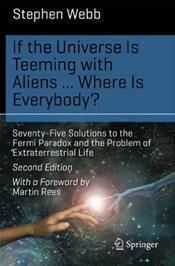 75 most cogent and intriguing solutions to Fermi's famous paradox: If the numbers strongly point to the existence of extraterrestrial civilizations, why have we found no evidence of them?